Mantis shrimps are exclusively marine, predatory crustaceans (Order Stomatopoda) that originated in the Cretaceous, and have remained remarkably similar in appearance for 100 million years. There are in excess of 100 genera and over 450 species worldwide, with about 65 genera and over 150 species known for Australia. Modern stomatopods are commonly known as mantis-shrimps because of the large raptorial claw, similar in appearance to the claws of mantid insects. Another common name, 'Prawn-killers', alludes to their frequent appearance in prawn trawler catches. 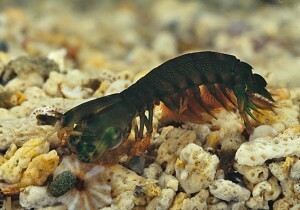 Stomatopods form two functional ecological groups known as 'spearers' and 'smashers'. 'Spearers' have the finger of the claw variously armed with a row of long forwardly directed spines which effectively penetrate and hold mobile prey species while they are killed. 'Smashers' generally lack such spines on the finger which is kept closed during the strike. Instead the swollen basal part of the finger is struck suddenly and forcefully against the shells of prey species to kill or stun the victim into immobility. Yellow-spot Smashing Mantis Shrimp (Gonodactylaceus falcatus): northern Australia; also Indo-West Pacific.